Launched in March 2012, the International SOS Foundation aims to improve the safety, security, health and welfare of people working abroad or on remote assignments. The Foundation do this by encouraging employers to equip their staff with up-to-date information and by providing advice about potential risks in unfamiliar destinations, to improve understanding of the actions people can take to mitigate those risks. 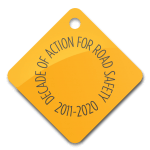 Working in collaboration with GRSP and using data from the Global Status Report on Road Safety 2015, International SOS Foundation launched in June 2016 a new road safety overlay feature in their widely used Travel Risk Map. The interactive map aims to educate business travellers on the various risks they face when travelling, and with road safety a leading cause of injuries amongst mobile workers, the road safety overlay has become a valuable resource for the mobile workforce. In further efforst to prevent incidents from occurring and reduce risks to employees as much as possible, the Foundation encourages organizations to educate travellers by providing an eLearning platform. Travel Risk: Road Safety eLearning was developed in partnership with the Global Road Safety Partnership, and is a 20-minute course featuring real-world scenarios and advice. Road accidents are one of the top five causes of medical evacuations led by International SOS. Different cultures, laws, customs and infrastructures can make every trip on the road a risk. Also, road safety isn’t just about being a safer driver. Sometimes, the safest option is not to drive at all. If you don’t know the rules of the road, highway conditions, or local language, you may be better off arranging transportation with a trusted and vetted provider. Travel security... think road safety.